Brilliantly neat and simple, the LIDE 60 is also the cheapest scanner in this test. The LIDE 60 uses a Contact Image Sensor (CIS) scanning head, as opposed to a conventional mirror/lens/ CCD system. In the past this type of scanner has been seen as a technically inferior solution, but Canon seems to have got it working pretty well here. LEDs are used for the light source, which means zero startup time and low power consumption. Indeed, the power consumption is so low the LIDE 60 is purely bus-powered. The only cable is the USB one. On the front are four scanner buttons for copying, scanning to a file, scanning to PDF or email. The scan-to-PDF function, being echoed on other scanners now, is particularly useful because it lets you assemble multiple PDFs in any order, and text is embedded in the PDFs for editing and searching. The LIDE 60's size and single-cable connection make it a joy to use. The descreening option is worrying, though, in that you're warned against using both this and unsharp masking at the same time. Another problem is that the auto tone option badly clipped the highlights in our photo scan - you'd be wise to leave this turned off for photos. The scan results were pretty good. Our A4 colour magazine scan maybe lacked a little contrast and outright definition compared to the rest, but the 150dpi mono scan came out fine, although there were strong interference patterns in halftoned photos. The 6x4-inch photo scan revealed that the LIDE 60 might at last be approaching its resolution limits, with slightly reduced detail rendition and some filling in of similar tones. The differences were slight, though. 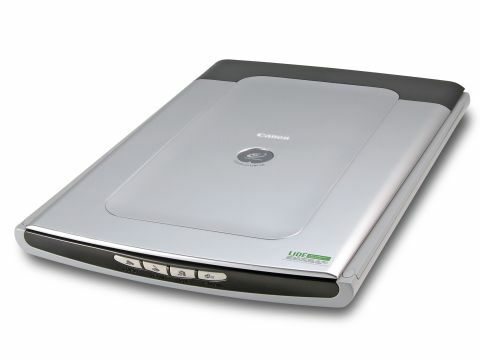 The LIDE 60 is cheap, compact and very efficient. It ranks lowest for overall scan quality, but the differences are small. Its chic charm may well win you over.